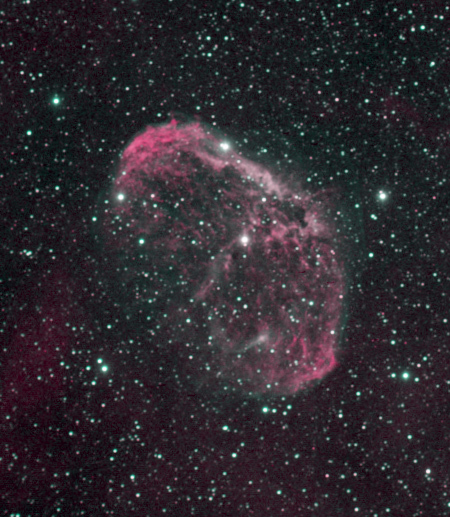 The following image of NGC 6888 combines the previous Ha image with new OIII data. The OIII data is has definite focus issues, and I think the previous image is better from an aesthetic point of view, but this does show more the OIII portion of the nebula. If you would like to see a spectacular image of this nebula, take a look at this image by Ken Crawford. This entry was posted on Wednesday, July 30th, 2008 at 9:26 pm	and is filed under Amateur Astronomy. You can follow any responses to this entry through the RSS 2.0 feed. Both comments and pings are currently closed.